For shoelace tips, see aglet. In modern usage, an "aiguillette" is an ornamental braided cord with decorative metal tips worn on uniforms or as part of other costumes such as academic dress, where it will denote an honour. This usage of "aiguillette" derives from lacing used to fasten plate armor together. As such, a knot or loop arrangement was used which sometimes hung from the shoulder. These aiguillettes should not be confused with lanyards, which are cords also worn from the shoulder (or around the neck), but do not have the pointed aiguillette tips and are usually of fibre rather than gold or silver wire, and often not braided. The modern aglet or shoelace tip and the decorative tips on bolo ties are types of aiguillettes. Portraits of the 16th and 17th centuries show that aiglets or metal tips could be functional or purely decorative, though many were used to "close" seams and slashes that are not always apparent on dark garments in portraits. They were made in matched sets, might be of silver, silver-gilt, or gold, and were worn in masses. Elizabeth's aiglets were variously enameled with white, red, black, blue, and purple details or set with diamonds, garnets, rubies, and pearls; those of Anne of Denmark in the early years of the 17th century were larger, shaped in triangles and pyramids. One set of 24 were made three-sided, with "27 diamonds in the sides and one in the top", for a total of 642 diamonds in the set. Surviving 16th or 17th-century copper-alloy lace tag found in London. 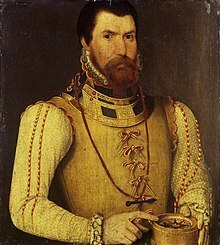 Lord High Admiral Clinton in an arming doublet of 1562, showing the decorative points or laces with metal tips for securing armour. The modern aiguillette derives from the laces used to secure plates of armor together—the breast- and back-plates would be attached on one side with short loops of cord acting as a hinge, and on the other by a longer and more ornate tied one,to support the arm defences. The ensuing knots would hang down the shoulder. (As with combat boots, the longer the lace, the less the need to undo the entire lace.) As armour became more ornamental and less practical, so too did the ties. This would also explain the aiguillettes of varying levels of complexity in the uniforms of the Household Cavalry (see picture above), as opposed to other "unarmored" troops. A version that says that aiguillettes originated in aides-de-camp and adjutants wearing a pencil at the end of a cord hanging from the shoulder has no historical base. Aiguillettes are worn on the right shoulder by armed forces officers serving in specific positions, such as aide-de-camp to the President, the Minister of Defense, each service's chief of staff and unit commanding officers, and by military attachés to Argentinian embassies abroad. The color of the aiguillette may be golden, silver or tan, depending the nature of the assignment. Olive green aiguillettes are worn with the combat uniform in very special circumstances, such as ceremonies and inspections. Otherwise, aiguillettes are not worn with the combat uniform. A special red aiguillette is worn by the adjutants to the commanding officers of the Horse Grenadiers Regiment (the presidential guard) and the Military Academy. Also, a red aiguillette is worn on the left shoulder by the senior NCO of each Army unit. A thinner, yellow aiguillette is worn on the right shoulder by NCOs who have completed the instructor course. In the Navy, adjutants to very senior officers wear golden aiguillettes on the left shoulder. Aiguillettes distinguish officers of Flag, General and Air rank in specific command appointments, Military Attachés and Aides-de-camp. Most senior officers and aides-de-camp to the Governor-General or state governors wear the aiguillette on the right shoulder, whilst Military Attachés and staff aides-de-camp wear the aiguillette on the left. Royal aiguillettes are of plain gold, naval aiguillettes are of blue and gold, army aiguillettes are of red and gold, air force aiguillettes of light blue and gold. The Governor-General of Australia, as the Commander in Chief of the Australian Defence Force, is entitled to wear a uniform on which an aiguillette made of platinum is worn. Aiguillettes with shoulder boards are worn by military aides-de-camp to the Governor General. The aiguillette is gold with brass tags and worn on the right shoulder. Aides-de-camp to the provincial lieutenant governors wear the same gold-pattern aiguilette on the right shoulder, but do not wear shoulder boards. Aiguillettes are worn on the left shoulder by aides-de-camp to generals, flag officers and diplomats. Aides-de-camp assigned to the Sovereign or officers holding a royal appointment wear the aiguillette on the right shoulder. Obsolete-style gold-braid aiguilettes mixed with army crimson, navy blue, or air force blue may also still be worn by aides-de-camp to lieutenant governors, flag and general officers and diplomats who still have them. The Danish military uses Aiguillettes for a number of different positions. Blue and yellow: Danish troops station during UNFICYP. Blue and red: the Bugle corps by Guard Hussar Regiment Mounted Squadron. Aiguilettes on the right shoulder are worn by officers filling certain duties. Staff officers in the President's staff, the Prime Minister's staff, the Minister of Defence's staff and the Maréchaux's Staff. The aiguillette is always in gold wire. The aides-de-camp to the President, the Prime Minister, the Chancellor of the Légion d'honneur, the Chief of the Defence Staff and the DGA. The aiguillette can be silver or gold, depending on the officer's corps. The AdC to the generals in the army and the air force and all the staff officers in the navy can also wear this aiguillette. The military attachés of an embassy. The aiguillette is always in gold wire. The Gendarmes. The aiguillette is white for the Gendarmerie départementale and gold for the Gendarmerie mobile, including the Garde Républicaine. The Bands. This aiguillette can be blue, red, or gold. Aiguillettes should not be confused with fourragères, which can be worn in the same way on the left shoulder in parade dress. In Ghana, aiguillettes form part of the ceremonial uniforms of commissioned officers in the army and other security services including the police, Prisons service, Fire service, customs and immigration. Senior police officers wear white aiguillettes with dark-blue uniforms, prison officers also wear yellow aiguillettes over the official ceremonial number one uniform while customs and immigration officials wear red aiguillettes with olive-green outfits. When worn, the aigullettes denote on-duty status. Aiguillettes are worn by the aides-de-camp to the President and Taoiseach. The President's ADC wears it on the right shoulder, the Taoiseach's ADC on the left. Civil Defence (Cosaint Sibhialta) personnel wear a white aiguillette on their dress uniform. Gold aiguillettes are also worn by officers in the Defence Forces with their Mess Dress uniform. They are worn on the left hand shoulder. In the IDF, soldiers who wear an aiguillette are mostly instructors. In the Israeli Police, policemen mainly wear a black aiguillette, and Israeli Border Police policemen wear a dark green aiguillette. Aiguillettes are worn by honor guard personnel. A single silver aiguillette is worn on enlisted cut uniforms of minor detachments. A single gold aiguillette is worn on officer cut uniforms of minor detachments. A double gold aiguillette is worn on officer cut uniforms of major detachments. All personnel of major detachments wear officer cut uniforms. Also, dembels (demobilized soldiers) often decorate their uniforms with makeshift aiguillettes. Aiguillettes are also worn on the left shoulder by musicians of the Singapore Armed Forces Band and the Singapore Police Force Band. Student musicians from both the National Cadet Corps Command Band and National Police Cadet Corps Band similarly wear aiguillettes mirroring the respective parent bodies. In Singapore, ADCs who are officers of the Singapore Armed Forces and the Singapore Civil Defence Force wear gold aiguillettes and police officers wear silver aiguillettes. Singapore Armed Forces ADCs wear a gold braid lanyard in lieu of an aiguillette when in No.3 and No.5(T). Additionally the newly commissioned ADC badges are worn across all five services' no.4 uniform. Full Aiguillettes (No. 1A) worn by the Chief of Defence Staff. In Sri Lanka, full aiguillettes are worn by members of the personal staff of the President of Sri Lanka and General officers, flag officers and air officers, while half aiguillettes are worn by the Colonels and Lieutenant Colonels in ceremonial uniforms. Aiguillettes (No. 1A) (Full Aiguillettes) of gold cord are worn on the right shoulder by; Field Marshals, the Chief of Defence Staff, the three service commanders, the Commander of the Army, the Commander of the Navy, the Commander of the Air Force. Aiguillettes (No. 1B) (Full Aiguillettes) of gold (and red orris basket in the case of Army) cord are worn on the right shoulder by; Aides-de-camp to the President of Sri Lanka and Aides-de-camp to visiting heads of state. Aiguillettes (No. 2A) (Full Aiguillettes) of gold cord are worn on the left shoulder by; General officers, flag officers and air officers in (ceremonial) uniforms No. 1, 2, 3, 4. Aiguillettes (No. 2B) (Full Aiguillettes) of gold (and red orris basket in the case of Army, black basket in the case of Navy) cord are worn on the left shoulder by; Military Assistants and Aides-de-camps to general, flag and air officers. Aiguillettes (No. 3) (Half Aiguillettes) of gold cord joined in the front and back by gilt cloth with a single metal aglet are worn on the left shoulder by Colonels and Lieutenant Colonels in (ceremonial) uniforms No. 1, 2, 3, 4. In the Sri Lanka Police, the Inspector General of Police, wear gold aiguillettes on the right shoulder, while Senior gazetted police officers wear black aiguillettes on the left shoulder in both formal and ceremonial dress. There are four types of aiguillette worn by the British Armed Forces. Aiguillettes (1st Class or Royal) are of gold-wire cord and are worn on the right shoulder by, among others, admirals of the fleet, field marshals and marshals of the RAF; honorary physicians, honorary chaplains, honorary surgeons and aides-de-camp to the Sovereign; equerries to members of the royal family. Some appointments carry the privilege of wearing miniature Sovereign's Cypher on the points of the aiguillettes. These aiguillettes are also worn by commissioned officers of the Household Cavalry (in full dress only). They are worn on the left shoulder in full dress by warrant officers of the Household Cavalry. Aiguillettes (2nd Class or Board) are of gold and dark blue, crimson or light blue depending if worn by Royal Navy, Army or RAF officers and are worn on the right shoulder by, among others, military members of the Defence Board and each Service Board and the personal staff of governors. A simplified version with no coils is worn on the left shoulder by staff corporals, corporals of horse and lance corporals of horse of the Household Cavalry in full dress. Aiguillettes (3rd Class or Staff) are of gold and dark blue, crimson or light blue depending if worn by Royal Navy, Army or RAF officers. They are worn on the left shoulder by, among others, attachés, assistants and aides-de-camp. 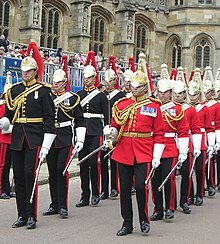 Simple aiguillettes are worn by lance corporals of the Household Cavalry and by bandsmen of Dragoon Guards and Dragoon regiments in full dress. The Commissioner of the Metropolitan Police wears silver aiguillettes in both formal and ceremonial dress. The Commissioner and Assistant Commissioner of the City of London Police wear gold aiguillettes on the right shoulder in ceremonial dress. Some officers of that force also wear gold aiguillettes on the left shoulder in ceremonial dress. U.S. Navy Ceremonial Guard Dress Aiguillette (White Uniform): One dark blue braided loop and two single loops. The aiguillette is worn on the right shoulder by military aides to the President and the Vice President. It is worn on the left shoulder by military assistants to the Secretary of Defense and the Secretary of Homeland Security, aides to the Service Secretaries (Secretary of the Army, Secretary of the Navy & Secretary of the Air Force), aide to the NOAA Administrator, military attachés, General Staff Corps officers, and aides to flag officers. The cord colors are gold for the Army and silver for the Air Force, gold and blue for the Coast Guard, Navy and NOAA Commissioned Officer Corps,with one braid "per star" of the Flag Officer (one for RDML, two for RADM, three for VADM and four for ADM), and gold and red for the Marines, with the number of braids corresponding to the rank of the General Officer similar to the Navy use. The gold cord aiguillette is worn by the directors of the United States Marine Band, while the enlisted personnel wear aiguillettes of white cord. A red aiguillette is worn on the left shoulder by United States Navy Recruit Division commanders, whereas a blue aiguillette is worn by Recruit Division commanders in training, Recruit Division commanders wearing these are referred colloquially as "red ropes" and "blue ropes" respectively. The U.S. Navy Ceremonial Guard in Washington, D.C. wears a blue aiguillette on summer white uniforms and a white one on winter blue uniforms. A blue aiguillette is worn on the left shoulder by cadets in charge of quarters at the United States Air Force Academy, as well as by military training leaders at technical training bases. Student airmen leaders at technical training bases (sometimes called "ropes" in reference to the aiguillette) also wear aiguillettes, with green representing the lowest level of student leadership, yellow representing the intermediate level of student leadership, and red representing the highest level of student leadership. Students wearing a white rope are commonly referred to as chapel guides, and are charged with providing social or moral support to their fellow airmen. Airmen who wear the black rope are experts in drill, choir, or ceremonies, and pride themselves on appearance and uniform wear. Airmen who wear a blue and white rope are members of the drum & bugle corps for their base. In the United States Air Force, honor guard members wear a silver aiguillette on the left shoulder. The aiguillette should not be confused with the fourragère, which is worn by soldiers and Marines who are assigned to units that were awarded certain decorations by the French and Belgian governments for valorous conduct in the First and Second World Wars. Nor should it be confused with the Schützenschnur, a multi-weapon marksmanship decoration awarded by Germany to qualifying soldiers of NATO countries serving in Germany. A similar, albeit thicker, device, the Infantry Blue Cord, is worn on the right shoulder by all enlisted soldiers and officers in the United States Army whose primary military occupational speciality is infantry. Many military units wear dress lanyards. ^ a b c Gaimster, David; Hayward, Maria; Mitchell, David; Parker, Karen (2002). "Tudor silver-gilt dress-hooks: a new class of treasure find in England". Antiquaries Journal. 82: 157–196. doi:10.1017/S0003581500073777. ISSN 0003-5815. ^ a b c d Scarisbrick, Diana (1995). Tudor and Jacobean jewellery. London: Tate Publishing. ISBN 1-85437-158-4. ^ "Origin of aiguillettes". All Hands. Australia: Naval Department Library. 615: 34–35. April 1968. ^ "Aiguillettes". Australian Army. 5 October 2016. Archived from the original on 2018-03-19. Retrieved 2019-01-06. Wikimedia Commons has media related to Aiguillette. Wikimedia Commons has media related to Fourragère.